This 12-story, eco-friendly (LEED certified) business centre occupies a prime downtown location amongst a variety of industries in this business-focused city. It provides efficient, healthy and cost-effective working space, abundant parking, and great access to public transport (including the airport) and major freeways. The Port of Oakland includes a world-class container port while the airport offers routes to major US cities, Mexico and seasonal routes to Europe. 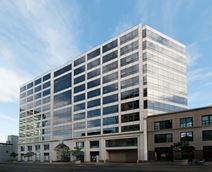 Situated within a highly desirable and well connected Downtown Oakland location with Broadway views, this exceptional and commercially significant business center location is well renowned throughout the locality as a major business venue and corporate hub, providing a diverse arrangement of office suites, event spaces and meeting spaces with a community focus based on creativity and entrepreneurship. This City Square center with easy access to local transport including BART makes the ideal office center for the legal professional. This Oakland location is close to the Marriott and other hotel accommodation. The regional transport links are also fantastic and offer all professionals with a number of services and facilities at all times; including bus services, underground rail networks, taxi ranks and easy access to major airports. This executive suite provides convenient access to all major Bay Area freeways. This award-winning building provides a range of offices to suit any business type and size. Parking is also available for clients and business. This prestigious building is located in a prime CBD location which means the business community is within easy reach. It also has easy BART and AC transit access across the rest of the region.